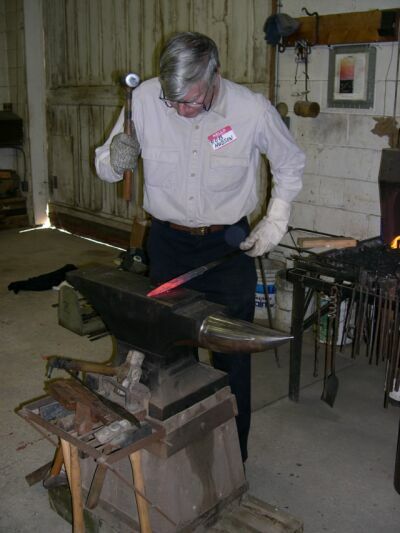 On Sunday Feb. 8, Dan Cruzan was gracious enough to open his shop in South Jersey for a blade-forging demo by Rob Hudson, Master Blade Smith of Rock Hall MD. 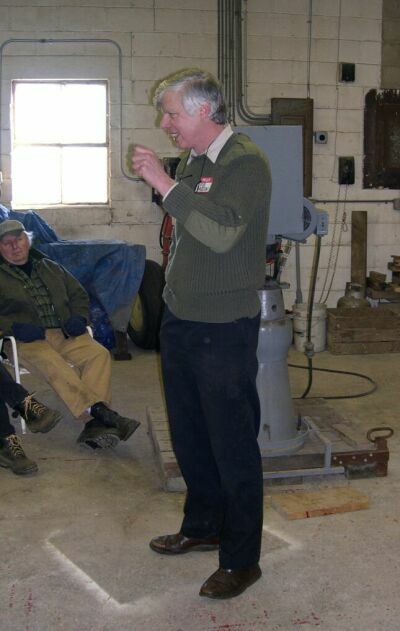 Rob opened with a talk about his background, his feelings about knife making, and the advantages of a forged blade over a blade ground from a blank. He also explained why a custom made knife was superior to a mass produced item. 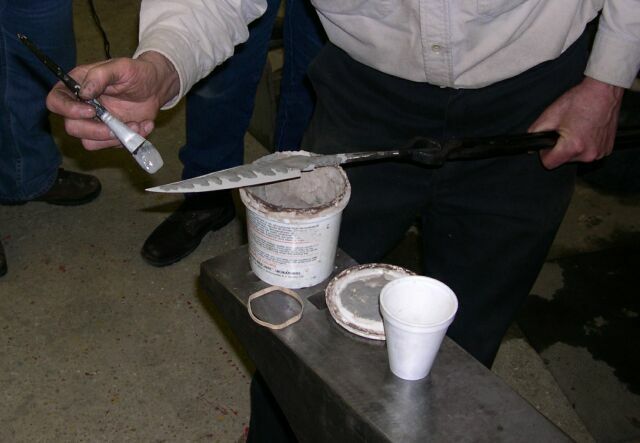 The hands on portion of his demo started with him forging a practice blade out of a ½ by 1inch piece of plasticine clay. 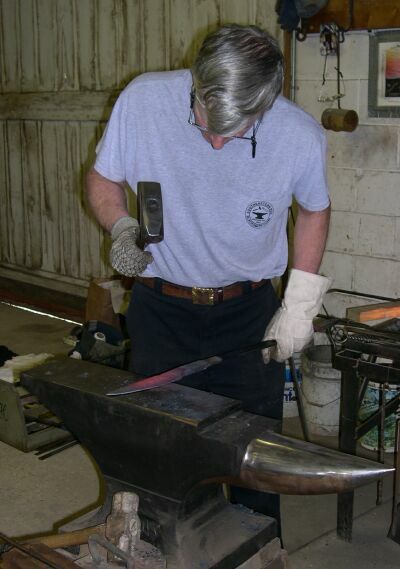 Rob explained that he does this to work out the steps in forging a blade to the final shape he is aiming for. 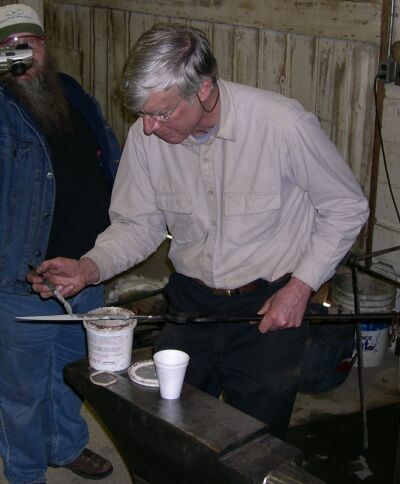 When he was satisfied with his clay form, he placed a ½ X 1 piece of W2 into the fire for his blade, He stressed that when forging a blade try to hammer equally on both sides of the stock and keep checking the work and keep it straight. 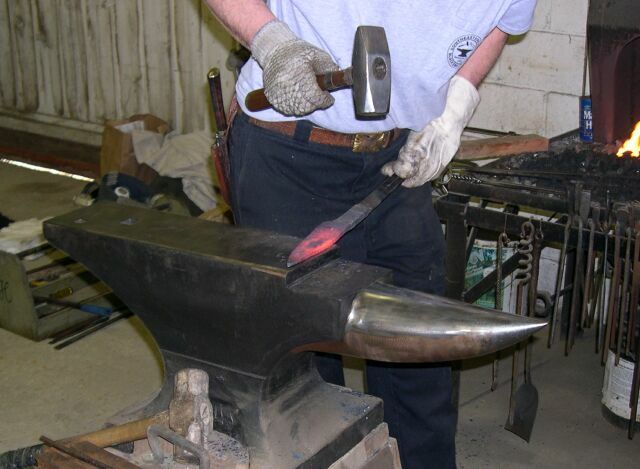 He showed that if the blade is pointing to far up or down it can be forged using a wooden slab on the anvil and a wooden hammer. 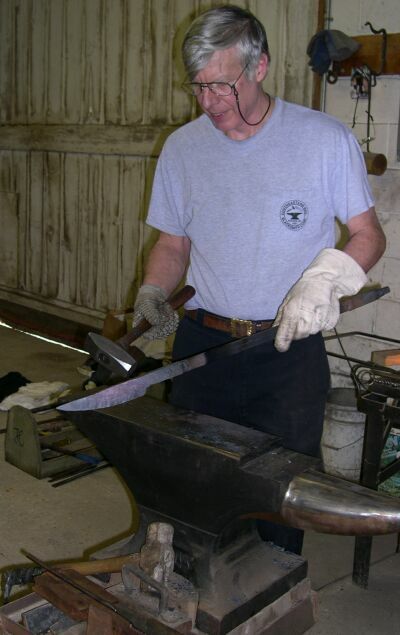 Rob adds a mild steel tang to his knives, (he gas welds this on using a nickel bearing rod) he does this because he peens the tang over to secure the handle and guard to the blade essentially making it one piece. 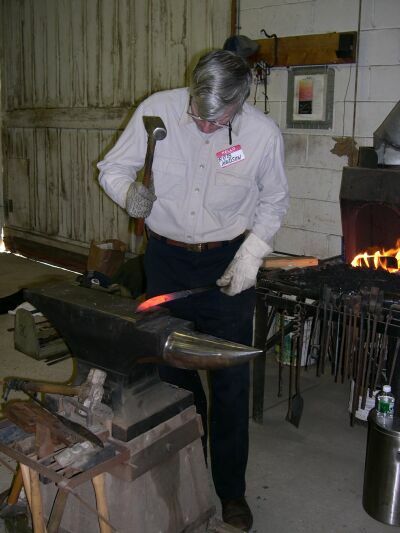 Once the blade was forged to shape he annealed it by bringing it to critical temp. cooling in air, bringing it to critical temp again then putting it in annealing medium (in this case the blade was wrapped in kaowool) at this point we broke for lunch to let the blade anneal. 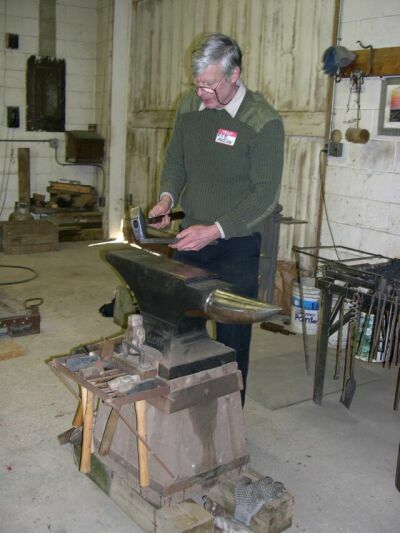 After a lunch of subs provided by NJBA and a large pot of homemade beef soup made by Dan Cruzan, Rob rough ground and filed the blade to its finished shape, then put a fine belt onto the square wheel grinder and gave the blade a final clean up before hardening. The blade was cleaned three times using lacquer thinner to remove all oils and fingerprints. He then used a mixture of Satanite (Harbison-Walker Ind.) and Kitty Litter thinned with water to paint a thin coating on the blade. After this dried he added a heaver layer on the back of the blade to introduce a pattern on to the blade and keep it a little softer. The clay mixture helps minimize warping and prevents scale. He then prepared his fire and quench for hardening the blade, for a quench Rob uses light vegetable oil pre heated to 450 degrees. He built a small cave in the coal fire using pine slabs; he stated that when they are burned they form a small, dark, charcoal oven that keeps oxygen away. 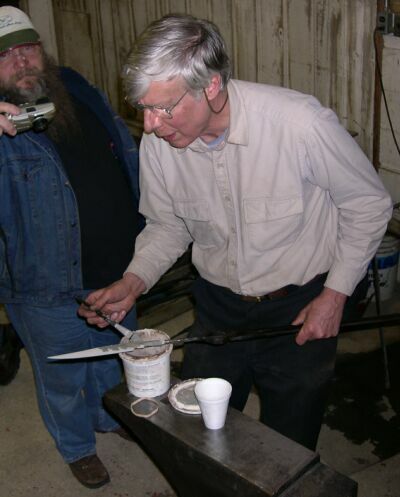 The blade was slowly and evenly heated to critical temperature (Rob checks this with a small magnet on a wire that he touches to the blade in the fire) then plunged in to the oil and held still until boiling stopped. 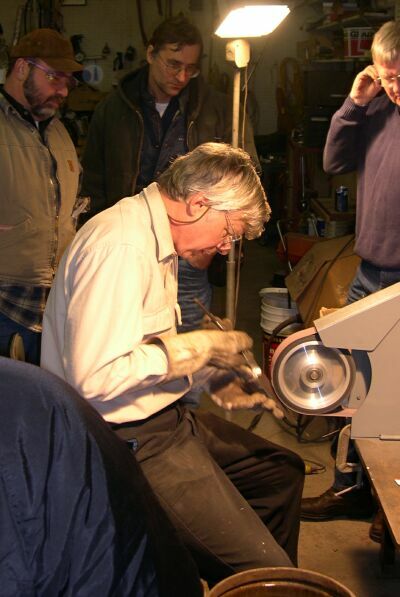 The blade was removed and checked for any warping, Rob explained that you now have about 45 seconds that you can correct any warping, after that the blade becomes too hard. 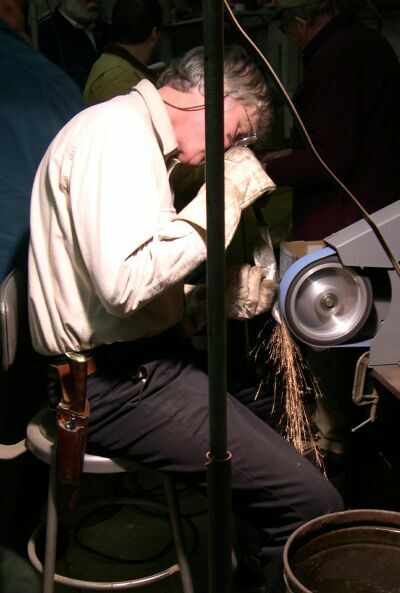 The clay was cleaned off the blade using a brass scrapper and tempered. Tempering is done in a small toaster oven at 450 deg., the blade is placed in the oven, brought to 450 and held for ½ hour, this is done twice.